One hundred and thirty children treated in Tel-Aviv hospitals Tel-Hashomer and Ichilov, their siblings and parents, organised by NGO "Rachashei Lev", Whisperings Of The Heart, literally fighting for their own lives every day and recovery from cancer, visit the Shalit family protest tent to strengthen abducted IDF soldier Gilad Shalit's parents. Their message "We will not allow this visit to become a tradition! Gilad must be released immediately!" Father Noam Shalit thanked the children and organizers for the visit and echoed their message wishing the children a full and speedy recovery. To the count of five, symbolizing Gilad's five years in Hamas captivity, the children released helium-filled balloons into the air to carry their prayers afloat. Their next stop - the Wailing Wall - to pray for the realization of all their yearnings at the holiest of locations for the Jewish people. Aviva and Noam Shalit have been living in the protest tent since arriving to Jerusalem leading a march of tens of thousands of citizens in July 2010. The tent is located at the entrance to the Prime Minister's official residence and visited by hundreds of thousands of supporters who come in solidarity to strengthen the Shalit family and to remind PM Netanyahu he still has a missing soldier in captivity. 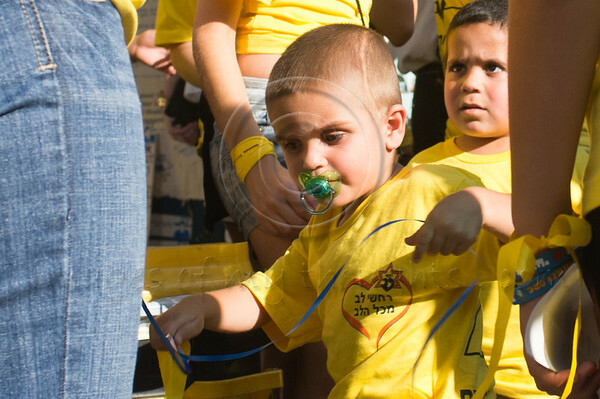 One hundred and thirty children fighting for their lives and recovery from Cancer visit the Shalit family protest tent to strengthen parents Aviva and Noam Shalit and pray together for the release of Gilad. Jerusalem, Israel. 12/07/2011.